In 1885 General Middleton was ordered to suppress the Riel revolt. They helped lift the siege of numerous northern forts and Hudson Bay trading posts and eventually helped in the capture of Riel, Chief Poundmaker and Chief Big Bear. Riel was hung for his part in the rebellion and Big Bear was briefly imprisoned for life for having taken up arms against the Queen; shortly thereafter she issued him a pardon and he returned to his lands. Unfortunately because he was retired British Military and because he was re-activated by the colonial government and not by the crown, Major General Strange was deprived of his pension from 30 years of service to the Crown. Later his pension was reinstated. At the time of the rebellion his ranch was raising cavalry horses. 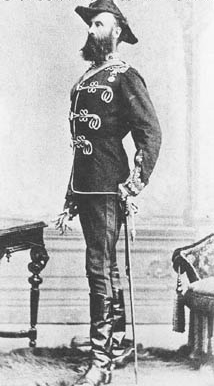 Several months after returning to his ranch he was kicked in the leg by a horse and his leg never healed properly, with his eldest son Henry Bland Strange off to the Royal Military College of Canada in Kingston and eventually serving in the Royal Artillery and with his ranch not doing as well as he hoped he sold the ranch in 1887 and returned to England where he spent his remaining days. He served as a salesman selling machine guns for the Hiram Stevens Maxim company and in the 1920’s at the age of 93 he wrote an article for the Canadian Defence Quarterly, he was noted to have been vigorous and active till his death in 1925. He was survived by two sons and three daughters. Back in 1861 he took a six-month leave from the military and embarked on a historic walking tour through the Himalayas starting from Tibet to Kashmir, most of the way he traveled on his own. In September of 1871 he accepted the post of first commander of the School of Gunnery at Quebec City, which carried with it promotion to the militia rank of lieutenant-colonel. The following year, he was made an inspector of artillery and warlike stores. This involved organizing Canada’s first permanent military units and training the militia gunners now that the new dominion had taken over much of the responsibility for its own defense. Strange’s location provided ample opportunities for his boundless energy and enthusiasm to show. He was fluent in French and found Quebec City very much to his taste. He was an active member of the Literary and Historical Society of Quebec. His impact on Gleichen can be felt in how years later Gleichen formed a Militia Artillery Unit. The Gleichen Gunners hockey Team is named after the artillery unit. In 1935, R. Armstrong of Gleichen was one of 35 survivors who received a medal on the 50th anniversary of the end of hostilities. Several Gleichen citizens received reimbursement from the government because of the incidents of 1885-86. The McDonnell Brothers received $3.80 for supplying 4lbs of tobacco and 2lbs of tea to the native scouts. The Gleichen CPR office received $16.86 for telegrams sent. P. Beaupre was paid $26.95 for the supplies he provided – 600lbs of hay, 115lbs of bran, 3 bottles syrup, 2 bottles vinegar, 4lbs butter, 4 dozen eggs, 1 bottle of lime juice, some lemons, 6 bottles of pain killers, candles, matches, coal oil, 13 plugs of tobacco and 2 tins of lobster. Also N.T. Williams was paid $14.25 for 475 lbs of Oats.